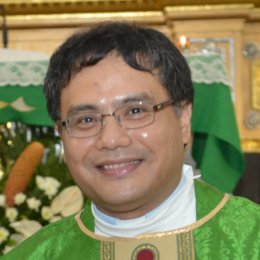 Fr Antonio was born in the Philippines but grew up in London. He gained his first degree in business and management studies at the University of Salford and earned a masters degree in digital media in London Metropolitan University. His employment history includes working as a personnel assistant for the London Borough of Newham, a communications officer for Caritas Manila and the Royal College of Nursing, and a web editor for Brunel University. He thought that his MA in digital media would be his final dabble in education but God had other ideas. He was accepted for priestly training in 2011 when Cardinal Vincent Nichols sent him to Rome for seven years of formation at the Venerable English College. He studied Philosophy at the Pontifical University of St Thomas Aquinas (aka the Angelicum) and Theology at the Pontifical Gregorian University. In 2016, he went back to the Angelicum to study for his Licentiate in Spiritual Theology. Fr Antonio was ordained to the priesthood on 28 July 2018 at his home parish in St George’s, Sudbury.